The Sandals Golf & Country Club. Ocho Rios, Jamaica, is located at the one-time Upton Golf Club, and became a part of the Sandals organization in June 1992. Located in Ocho Rios, Jamaica, the golf course is set upon the rolling landscape with stunning views of the ocean and the mountains. It's a short course, just 6,400 yards for a par of 71 and a course rating of 70.9, but don't let that put you off. It's a fun course with tight fairways, tiny greens and will provide an easy (by that I mean leisurely), though challenging, round of golf. They do say that Sandals now boasts one of the finest Golf Courses in the Caribbean. In fact, Golf Digest Magazine gave the golf course a four-star rating for courses to play whilst on vacation. Sandals' is the ultimate (my opinion) all-exclusive vacation destination. I've stayed at a couple and never have have I failed to enjoy the resorts, the locations, the amenities or the golf. Now, with their "Stay at One, Play at All Sandals" program you really do have it made: you can enjoy all the amenities at all of the Sandals locations in Jamaica, no matter which one you choose to stay at. There are actually seven Sandals resorts in four different Jamaica locations (Ocho Rios, Whitehouse, Negril and Montego Bay). Resorts I can personally recommend include Sandals Royal Caribbean and Sandals Montego Bay. Several of the resorts are just a shuttle ride away from the golf course. The golf? Well, here's just a little of what you can expect: Complimentary Green Fees to all Sandals Guests. Complimentary transportation to all guests of Sandals/Beaches Resorts within Jamaica's Ocho Rios area. Complimentary golf lessons Monday - Saturday. Lessons are bookable through the resort's Tour Desk. Caddy is mandatory at $18 per caddy for 18 holes; $12 for 9 holes; Carts are optional at $40 per cart for 18 holes; $25 for 9 holes. Club Rental: Precept: $25. Callaway: $45 (all rentals available in ladies and gents, left & right handed). Shoe rentals (includes free socks) $16. About All-Inclusive Resorts: What can you expect? Well, when you stay at an all-inclusive resort, accommodations, meals, soft drinks, gratuities, recreational activities, entertainment and most alcoholic drinks are usually included in the daily rate. Many also offer a selection of sports and other activities included in the price as well. Some all-inclusive resorts are designed for specific vacation interests – and some especially for golf - and some resorts cater to adults, while even more specialized properties accept couples only. Learn more about All-Inclusive Resorts. 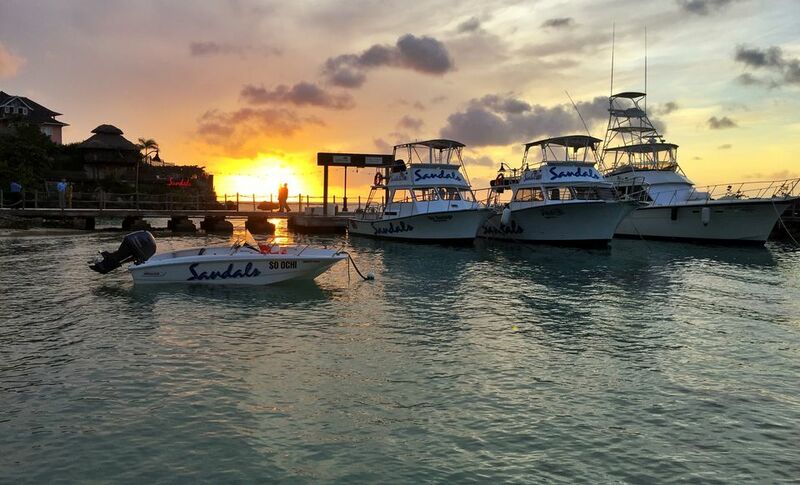 The Sandals organization is eager to get you to one of their resorts in Jamaica, so much so that at any time of the year there are a range of enticing special packages available. These can be found by going to the Sandals website. The airport is Sangster International Airport (MBJ), the leading tourism gateway to the island of Jamaica. Return to Review of Top 10 Golf Courses and Resorts in Jamaica. And don't forget: there are many other opportunities for great golf all over the world. Favorite locations include Scotland, Florida, the American Southwest, Bermuda, the Bahamas and many more. For up-to-date golf travel news and information, be sure to Subscribe to my weekly Newsletter. Where "The Bachelor" Said "I Love You"